Begonia is an adult female Mulga Parrot, also known as the Many-Colored Parrot. Mulgas are one of the few species of parrot where the male and female have different colorations. Begonia came to us from a major hoarding situation, so we are uncertain of her age. 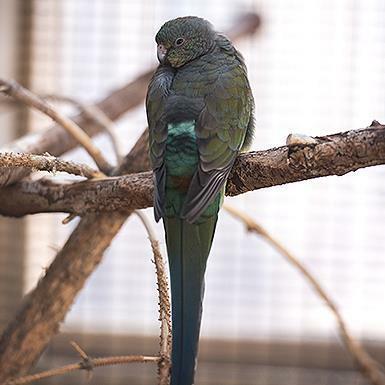 Mulga Parrots can be extremely nervous birds who do not do well in cages. Their ideal environment would be a large flight or aviary. Begonia is bonded to Kodachrome, a male Mulga Parrot, and they must be adopted together.